See the National Catholic Reporter’s April 22 article on this historic gathering here. Pace e Bene’s John Dear and Ken Butigan — who teaches in the Peace, Justice and Conflict Studies Program at DePaul University — joined participants from nations around the world, including Mexico, Venezuela, Costa Rica, Colombia, Honduras, Brazil, Canada, the United States, Uganda, Philippines, Pakistan, Sri Lanka, Fiji, South Sudan, Kenya, Nigeria, Ethiopia, Palestine, the United Kingdom, France and Italy. Peacemakers, theologians, archbishops, bishops, educators and those in pastoral ministry attended this historic assembly. In addition, the Dicastery's Prefect Cardinal Peter Turkson (Ghana) was present, as was Cardinal Joseph Tobin (Newark, New Jersey, USA). "Our conversations on nonviolence and peace filled our hearts and minds with a consideration of the dignity of each person - young people, women and men, people who are impoverished, citizens and leaders," said Mons. Bruno Marie Duffé, Secretary of the Dicastery. "Nonviolence and peace call us to a conversion to receive and to give, to gather and to hope." 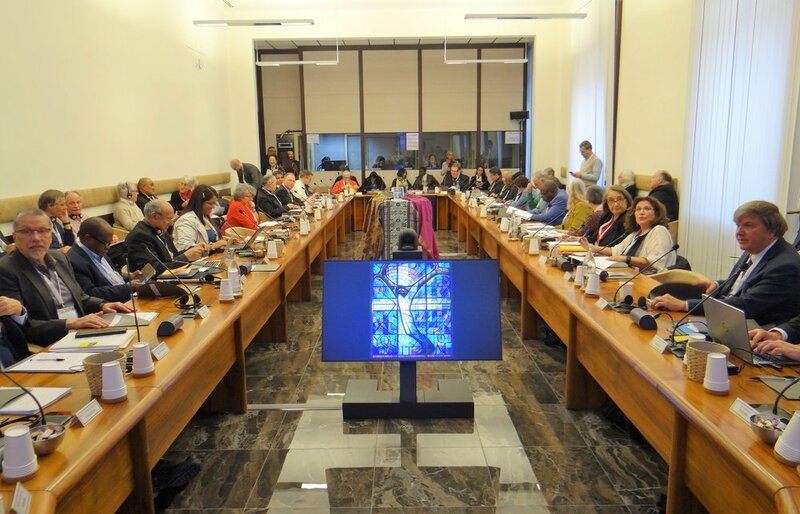 "Pax Christi International deeply appreciates the support and participation of the Dicastery in this workshop, which has been a significant and positive step in the work of the Catholic Nonviolence Initiative," said Marie Dennis, Co-president of Pax Christi International. "We are touched by the interventions from all the participants, who reiterated the importance of nonviolence rooted in respect, patience and spiritual strength." Participants will continue their dialogue and research; their reflections will be shared with Pope Francis, with the hope for a possible encyclical that will address these issues and challenges and will promote nonviolent initiatives as a way for mediation, rights, hope and love.